Happy Friday, I am a D.C. native and old enough to remember the Washington Capitals' first season. Congrats to the team for finally winning the Stanley Cup. Thanks for reading, and if you want a daily and deeper look at China, please check out my daily Sinocism China Newsletter and follow me on Twitter @niubi. This newsletter will be on holiday June 15. See you June 22. Russian President Vladimir Putin is on a state visit to China, which will include attending the 18th Shanghai Cooperation Organization (SCO) summit June 9-10. Xi described China-Russia comprehensive strategic partnership of coordination as "mature, stable and solid." No matter how international situations change, China and Russia always firmly support each other in defending their respective core interests, deepen cooperation in all areas, jointly and actively participate in global governance, and play a pivotal role in establishing a new type of international relations and building a community with a shared future for humanity, Xi said. They are also expected to discuss North Korea and the upcoming summit between North Korean leader Kim Jong-un and President Trump. Why it matters: Many Western observers dismiss the Xi-Putin bromance as a tenuous friendship that poses no real challenge to the West. 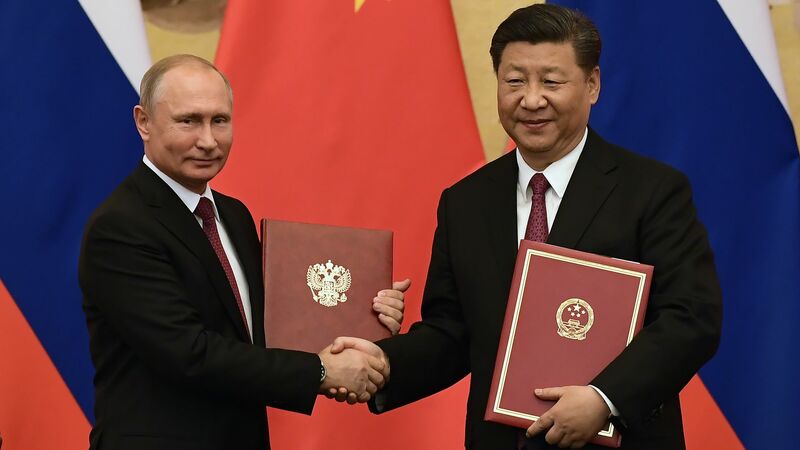 There are many points of potential friction in the China-Russia relationship but it is risky to dismiss this renewed friendship too quickly as both Xi and Putin see massive opportunities from Trump's approach to foreign relations. Separately, Trump just said he wants Russia invited back into the G-7. In the wake of the settlement between the U.S. and the state-owned Chinese enterprise ZTE, Yin Yimin, the new ZTE chairman, apologized in a memo to staff. "[The deal] is a bill that must be paid by a multinational firm that violated a contractual obligation...consequences that must be borne as the result of contempt for laws and regulations." Chinese firms with international business should have international standards and not be "giant babies...who use commercial interests to coerce the government." But Xinhua also details the process Beijing went through to save ZTE and states that "a powerful and self-confident government is a firm backup for the people." Not stated by Xinhua, but clearly another big lesson for PRC firms from this case, is "don't get caught." Why it matters: The ZTE mess was another wakeup call about China's vulnerability to foreign technology, but it may also be used as a negative educational example to improve compliance and global behavior by the increasing numbers of PRC firms going global. What's next: Some members of U.S. Congress want to block the deal, but it appears unlikely they will succeed. And so far there are few details about the insertion into the company of a U.S. compliance team. The big questions: Who decides who's on that team, and will it end up being a huge payday for big U.S. law, consulting and accounting firms? Will Beijing assume that some or all of the members of the compliance team are working for U.S. intelligence? Facebook came under fire earlier this week for deals it made with several PRC phone makers, and especially Huawei. Now lawmakers are pressing Google for details of its deals with Huawei. Axios' Erica Pandey writes: China's biggest tech companies have thrived at home, easily beating out what little foreign competition they face and monopolizing several industries at once — but at a steep cost. China's tech darlings have free rein, as foreign competitors like Amazon and Facebook face barriers to entry and regulations on Chinese domestic companies allow them to set up monopolies on the market. But that free rein stops when they attract attention from the Communist Party in one of two ways, says Derek Scissors, an expert on China's economy at the American Enterprise Institute — they either get too big or enter strategic sectors. The party has already demonstrated its willingness to go to lengths to maintain control over Chinese commerce. The chairman of Anbang, Wu Xiaohui, was swiftly charged with fraud and sentenced to 18 years in prison as part of a party crackdown on risky corporate spending. Chinese billionaire Wang Jianlin turned heads when he announced he was selling off international assets and focusing on domestic investments. The bottom line: The Chinese government gives its corporate champions nearly unfettered access to the country's 770 million internet users, but that comes with the fear that Xi could make it disappear in an instant. And as China's tech giants get bigger and richer, the Communist Party gets more nervous. Go deeper: Read Erica's full story here and check out Axios' Ina Fried's piece on "Why our tech battles with China are so complicated." Axios' Dan Primack reports in his Pro Rata newsletter: Ant Financial, the financial tech affiliate of China's Alibaba Group, raised $14 billion in Series C funding. Why it matters: This is the largest single fundraise ever for a private company, and severely strains the terminology limits of "venture capital." The round includes an RMB tranche for Chinese investors and a U.S. dollar tranche for other investors. Investors in the dollar tranche include: GIC, Khazanah Nasional Berhad, Warburg Pincus, Canada Pension Plan Investment Board, Silver Lake, Temasek, General Atlantic, T. Rowe Price, The Carlyle Group, Janchor Partners, Discovery Capital Management, Baillie Gifford and Primavera Capital. Ant Financial Services Group is one of five companies involved in a pilot program that the central bank started in December to test new rules for financial holding companies. The company now serves more users than some of China’s largest banks, which themselves are considered global systemically important financial institutions by the Financial Stability Board, an international body that monitors the global financial system. My thought bubble: Ant Financial is too big to fail but has expanded so quickly that the regulators have not kept up. A more mature and stable regulatory environment may actually be good for the company. Smartphone giant Xiaomi has submitted the first application to PRC regulators to list Chinese Depository Receipts (CDR) on the domestic A-share exchange at the same time it has its IPO in Hong Kong. Background: The China Securities Regulatory Commission (CSRC) issued detailed rules earlier this week for the long-awaited CDR program which will for the first time offer PRC domestic investors onshore access to trading in shares of some of the country's biggest internet and tech firms. Earlier this week regulators also approved six money managers to establish funds totaling nearly $50 billion to invest in the coming wave of tech unicorn CDRs. The bottom line: A great wall of cash awaits these tech CDRs and PRC punters may drive their valuation multiples inside China far higher than those outside China, which should lead to all sorts of interesting arbitrage opportunities for savvy investors. Plus, the massive amounts of capital available to PRC tech entrepreneurs along with increasingly viable paths to liquidity inside China should help the country overcome much of the “innovation tax” that stems from the political controls. The State Department received medical confirmation that a U.S. government employee in China suffered a medical incident consistent with what other U.S. government personnel experienced in Havana, Cuba. As a result of additional voluntary medical screenings, the Department has sent other individuals to the United States for further evaluation. If you or members of your family experience any unusual, unexplained physical symptoms or events, auditory or sensory phenomena, or other health concerns, please contact your health care provider to determine whether a medical evaluation and/or treatment is advisable. Symptoms to be attentive for include dizziness, headaches, tinnitus, fatigue, cognitive issues, visual problems, ear complaints and hearing loss, and difficulty sleeping. Go deeper: Read How We Reverse Engineered the Cuban “Sonic Weapon” Attack by Kevin Fu, Wenyuan Xu and Chen Yan, a professor at University of Michigan–Ann Arbor, a professor at Zhejiang University and a Ph.D. student at Zhejiang University respectively. 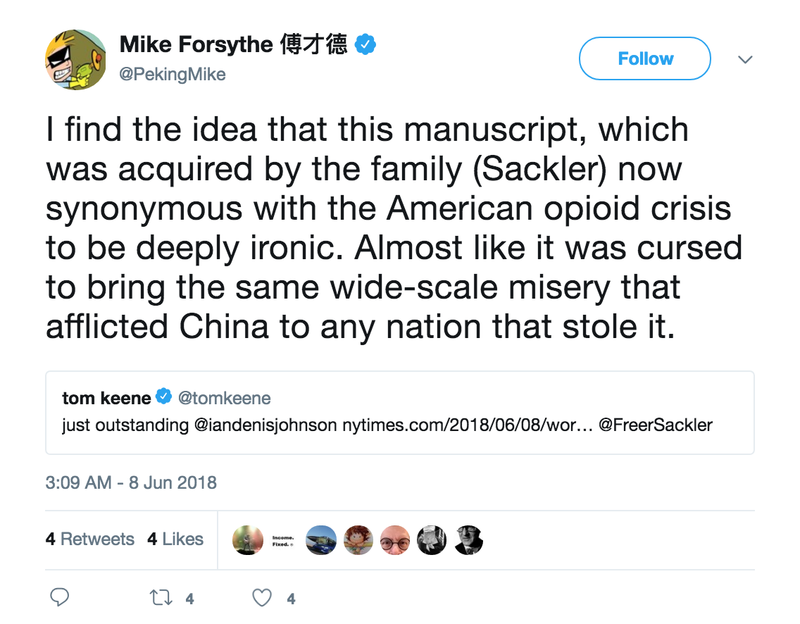 Ian Johnson has a fascinating story in the Friday New York Times about the 2,300-year-old Chu Silk Manuscript that is now owned by the Arthur M. Sackler Foundation. a prominent Chinese historian and archaeologist has pieced together its remarkable odyssey in a meticulously documented analysis that has caused a stir in the rarefied world of Chinese antiquities and raised broader questions about collectors who profit from pillaging historic sites. the silk manuscript is of special interest in China because it dates to the crucial Warring States period, when lasting Chinese traditions such as Confucianism and Taoism took shape. It is also important because it offers the earliest descriptions of the gods that Chinese worshiped in that formative period. The New York Review of Books — One Decent Man - Geremie R. Barmé reviews "Simon Leys: Navigator Between Worlds"